Varthur Hobli, Banglore-560035, Karnataka, India. 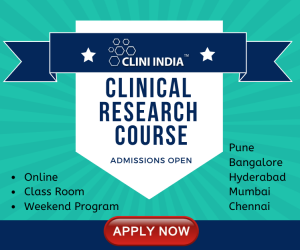 Current advancement in drug discovery technology and search for novel chemical diversity have intensified the efforts for exploring lead from “Ayurveda” the traditional system of medicine in India. Lantana camara, Family: Verbenaceae has been important coniferous plant in ayurvedic and indigenous medicinal systems. The Clinical trials and animal research support the use of Lantana camara for anti-spasmodic, carminative, anti-tumour, anti-inflammatory, anti-malarial, anti-ulcer genic, treatment of emotional stress and trauma, anti-microbial, insecticidal, fungicidal, asthma. Major biochemical constituents of Lantana camara were identified as alkaloids/flavonoids, saponins/tannins, germacrene-A, B and D, triterpenes like lantadenes-A, B, C, D, valencene (principle constituent) and γ-gurjunene, verbascoside, martynoside.This paper includes the evidence-basedoverview of pharmacological and phytochemical properties of the aerial parts of Lantana camara. The plant Lantana camara linn. Family- Verbanaceae is commonly known as wild sage or red sage and lantana weed. A large scrambling evergreen, strong smelling shrub with stout recurred prickles, leaves were opposite, often rugose, scabrid on both sides, flowers were small, normally orange but often white to dark red, in heads which are prominently capitates; bracts conspicuous and persistent. Fruits were small, 5 mm diameter, greenish?blue, blackish, drupaceous and shining with two nutlets. Seeds were germinated easily throughout central and south India in most dry stony hills and black . 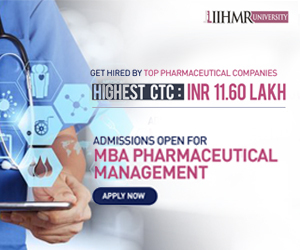 The different parts of plant extract were useful in various diseases like diaphoretic, tonic, antispasmodic, wounds, ulcers, swelling, carminative, tumours and rheumatism, anti-spasmodic, carminative, anti-tumour, anti-inflammatory, anti-malarial, anti-ulcerogenic, treatment of emotional stress and trauma, anti-microbial, nematididal, insecticidal, fungicidal, influenza, asthma,antidote to snake venom, eczema, gastrointestinal disorders anti-nociceptive, anti-pyretic, inhibitor of acetyl cholinesterase, abortificient,anthelmintic, diaphoretic, febrifuge, carminative, rheumatism, to make cheap furniture, skin diseases, adulticidal activity, larvicidal, biological control . Major biochemical constituents of Lantana camara were identified as triterpenes like lantadenes-A,B,C,D, alkaloids, flavonoids, saponins, tannins, germacrene-A,B and D, valencene (main compound) and γ- gurjunene. Lantana camaraplant is found mostly in the South India, in Tamilnadu (Kuppandapalayam), in America, in Africa, mostly native to subtropical and tropical America, but a few taxa were indigenous to tropical Asia and Africa, and also found in Himachal Pradesh, Jammu-Kashmir, and Uttar Pradesh. 100 genera and 2000 species of Verbanaceae family, Lantana is a genus of 150 species that were very popular as popular ornamental garden plant. Among of 150 species of Lantana camara, some species are L.achyrantifolia Desf., L.indica Roxb., L.montevidensis Briq., L.salvifolia Jacq., L.orangemene, L.trifolia, L.tiliaefolia Cham, L.viburnoides Vahl. Butterflies are said to love Lantana camara flowers when bloom, young flowers are in yellow colour and old are in red colour . The plant is serious weed in the hilly terrecins and also in the plains of the country weeds were known to be inhibit growth of neighbouring vegetation due to release of phytotoxins. 1) Mono and Sesquiterpenes:They contain bisabolene derivatives with traces of monoterpenes and β-curcumene(1.5%), E-nuciferal, z-nuciferol(3.9%), (-)ar-curcumene-15-al(5.6%), γ-curcumene(8%), ar-curcumene(9.7%), (-)epi-βbisabolol(10%), (-)γ-curcumene-15-al(14.9%). 2) Triterpenes:Lantadene-A,B,C,D, Pentacyclic triterpenes like oleanolic acid, ursolate acetate, ursolic acid, reduced lantadene, lantalonic acid, lantic acid. 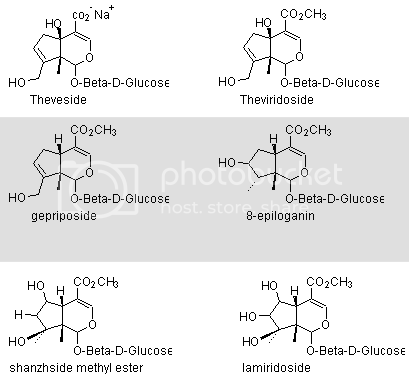 3) Iridoid glycosides: Theveside, theviridoside, gepriposide, 8-epiloganin, shanzhside methyl ester, lamiridoside. 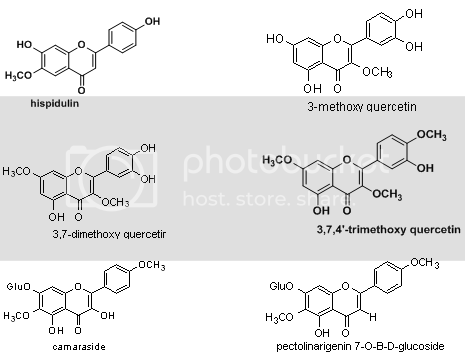 5) Flavonoids:3-methoxy quercetin, 3,7-dimethoxy quercetrin, 3,7,4’-trimethoxy quercetin, camaraside from Lantana camara and fromL.camara var aculeata-pectolinarigenin-7-O-β-D-glucoside. 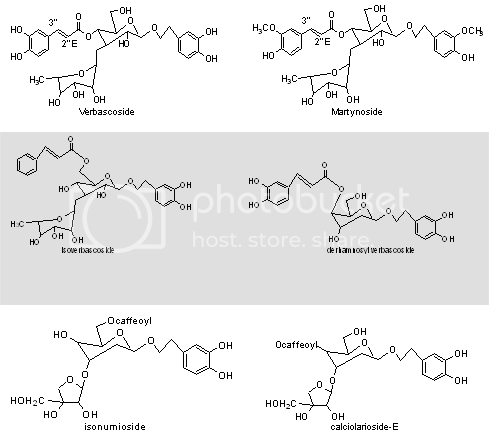 6) Phenylethanoid glycosides:verbascoside, martynoside, derhamnosylverbascoside, isomumioside, calceolarioside E.
7) Miscellaneous: contain β-sitosterol, campesterol, stigmasterol has been isolated from plant and stems contain high yield of stigmasterol and six oligosaccharides like ajugose, stachyose, verbascotetraose, verbascose, lantanose A, lantanose B has been isolated from roots of Lantana camara. 8) Phytochemistry of other Lantana species: The flavones like penduletin, chrysosplenetin has been isolated from aerial parts of Lantana achyranthifolia desf. Whereas from extract of L.hydria contain 1-(3-glucosyloxy-4-hydroxycinnamyl) glucose, from flowers-1-caffeoylrhamnose and monoterpene glucoside ester from L.lilacia Desf. 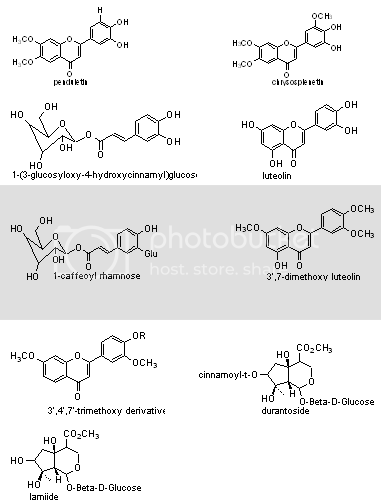 And from L.montevidensis - luteolin and its 3’,7-dimethoxy and 3’,4’,7’- trimethoxy derivatives and iridoid glycosides from roots of L.viburnoids like lamiide, durantoside has been isolated. The Lantana camara plant has been used to treat a wide variety of disorders. It was found to use in folk remedies for cancers and tumours. In Central and South America, the leaves were made into a poultice to treat sores, chicken pox and measles. In Asian countries, leaves were used to treat cuts, rheumatism, ulcers and as a vermifuge. Decoctions were applied externally for leprosy and scabies. L.camara also used to treat cold, rheumatisms, asthma and high blood pressure with preparations from the plant. A tea prepared from the Lantana camara leaves and flowers was taken against fever, influenza and stomach-ache. In Ghana, infusion of the whole plant was used for bronchitis and the powdered root in milk was given to children for stomach-ache. From the leaves, an alkaloid fraction which lowered blood pressure, accelerated deep respiration and caused shivering in dogs was isolated. It was suggested that it may be useful in reducing fevers, and as a treatment of asthma and hypertension. It has been claimed that a steroid, lancamarone from the leaves exhibited cardio tonic properties and lantamine, an alkaloid from the stem bark and roots showed antipyretic and antispasmodic properties, but the validity of these claims has not been confirmed . The roots of Lantana camara rich in olenolic acid. A hepatoprotective triterpenoid and translactone containing triterpene from lantana leaves showed thrombin inhibitory activity. 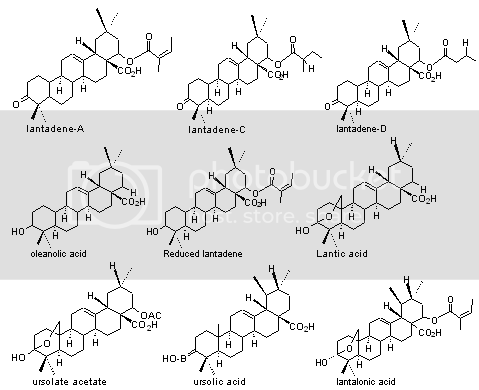 A pentacyclic triterpenoid showed attention for drug research for anti-cancer, anti-microbial, AIDS, anti-inflammatory activity and contain Lantadene - A,B,C, oleanolic acid(major). A flavonoid in L.trifolia leaves contain umuhengerin as anti-microbial and triterpenoid like ursolic acid used for anti-inflammatory activity and in stems leaves, roots contain oleanolic acid, ursolic acid. L.filiaefolia given orally for anti-hyperlipidemic, anti-tumour activity and contain verbascoside (a protein kinase-c inhibitor) for anti-tumour activity and methanolic extract inhibit human thrombin and 20-pentacyclic triterpenoids like oleanane, ursane, lupine has been obtained. L.camaraethanolic extract (10, 50, 100mg/ml concentration) investigated for its anthelmintic activity against pheretima posthuma due to presence of tannins which bind to proteins in the GIT of host animal or glycoprotein on the cuticle of parasite and cause death . The leaf extract of Lantana camara has been showed antiseptic, anti-leprosy activity. The ethanol extract of L.camara increased the rate of wound contraction by 87 % in burn wound when compared to controls (82%). The slight reduction in the wound area might be due to the antimicrobial effect of the leaf extract against Staphylococcus aureus, Klebsiella andEscherichia coli. By comparing between 1st and 19th day significant wound healing activity showed in Sprague dowley rats (figure-3,4,5,6). The hydroalcoholic extract and fresh juice of L.camara leaves have flavoured wound contraction (kurian 1995) . The ethanolic and methanolic extract of Lantana camara leaves and flowers showed a good larvicidal activity against mosquito species like Aedes aegypti and culex quinquefassciatus. It was also showed the maximum mortality with 0.1mg/ml concentration for 24 hours (Table-1 and 2). A wide range of chemical compounds has been isolated from L.camara was found to be used as larvicidal activity . Aqueous and acetone extract of L.indica leaves were governed for 24 to 96 hours to the fresh water snails lymnaea acuminata and larvae of culex quinquefasciatus. LC50 decreases from 7.32 mg/l (24 hrs) to 1.02 mg/l (96 hrs) against L.acuminata and 10.99mg/l (24 hrs) to 5.18mg/l (96 hrs) against C.quinquifasciatus, so L.indica was used as natural pesticide for vector control . Senthil Nathan et.al 2006 were studied L.camara for their larvicidal action, which act against fourth instar of culex quinquefasciatus (kalayanasundaram and dos 1985) . Essential oil of L.camara has highest adulticidal activity against anopheles fluviatilis followed by anopheles stephensi, anopheles culicifacies(malaria), culex quinque fasciatus(filariasis), aedes aegypti(dengue, chikungunya) and for longer period due to low volatile nature of oil .